If you have a Facebook Business Page, be wary of any partnership requests to lease out your Ad Account to advertise other people’s products or services. These could put you in financial or legal hot water, as well as harm the reputation of your Page or brand. One of my clients recently received an unsolicited email with an offer to make money by providing access to her Facebook Business Page and Ad Account. Although she dismissed it as some sort of scam, she forwarded it to me to see what I made of it. On further investigation, I found there are also hundreds of job listings on Craigslist and elsewhere, offering the opportunity to earn money working from home by providing access to your Facebook Ad Account. Unfortunately, unsuspecting Facebook Page Owners may not realise the repercussions of signing up for something like this. The opportunity to make $250+ per week from their Page, especially if they’re not currently advertising on it, can prove tempting for some. However, the only reason someone would want to use your Ad Account for their ads is that they advertise products and services in a way that ultimately get accounts shut down by Facebook. Advertisers on Facebook must follow specific guidelines around what products and services can be advertised, the language and claims used, and who can be targeted. A non-compliant ad may be auto-approved, but then disapproved by further review, sometimes weeks later. An Ad Account that continually attempts to breach these guidelines can then be completely shut down by Facebook. Forever. Below, I break down the explanation and implications of each of their claims and offers. “Through our partnership, you can easily make $250 a week, without having your Facebook Page affected in any way, and receive more traffic to your page. The reason they can claim your Facebook Page won’t be affected in any way is because they are running their ads from your Ad Account, rather than as posts on your Page. Facebook Ad Specialists legitimately run ads this way, as ‘unpublished’ or ‘dark’ posts. This is to test different creatives, copy, audiences and landing pages. These are usually not published directly on the Facebook Page, as fans would unfollow if they continually saw slight variations of the same post appearing in their News Feed. Unfortunately, something WILL be ‘attached to your account’ – a bad rating for your Ad Account, and likelihood of it being shut down by Facebook for violating its terms of service. This means if you ever want to run ads from your Facebook Page in the future, you will simply not be able to. Usually when Facebook shuts down a Page’s Ad Account, it is shut down forever, or at the very least, for months, if you are able to successfully appeal. As a sweetener, these types of scams often offer $50 ad credit to promote your Page to find more followers or ‘likes’. Although this might sound good, it’s not actually in your best interests. You would have no control over the types of people this Page Like campaign would target. The audience would likely be very broadly targeted, in countries where likes are cheap, and not where your Page followers or business clients normally reside. Having Page likers who are not engaged can then affect overall Page engagement, especially when it comes to organic reach. Facebook has already limited organic reach to under 10%, which means every time you post, less than 1 in 10 people see it in their feed (unless you pay to promote it). A Page audience that is not engaged results in this dropping further, even as low as 1%. You would also have no say or control over how your brand or Page is represented in this Page Like campaign. It could literally say ANYTHING. So yes, this WILL affect your Page! “Facebook allows leeway to people who own very strong pages, and since our advertisements are “aggressive”, we need your help. There is no ‘leeway’ requirement as far as Facebook ads are concerned. Anyone with a Page can advertise on Facebook, and you don’t need a ‘strong page’ to do so. Ads don’t ‘stay up’ because you have a Page with many wall posts that has been active for ‘quite some time’. They ‘stay up’ because they abide by Facebook’s terms of service. And if they don’t, Facebook will disapprove them, and potentially close down your whole account – regardless of the ‘strength’ of your page. This level of ‘Editor/Advertiser’ access is actually what legitimate Facebook Ad Specialists will ask you for as well, if you engage them to run ads on your behalf. This ‘$50 worth of page promotion on a daily basis’ relates to the Page Likes campaign I mentioned earlier. So, that means they are attaching a credit card to your account (an account that is legally in YOUR name), spending $350 a week ($50 a day) on your Page likes alone, PLUS an ‘aggressive’ ad spend on their own ads. This is likely in the hundreds of dollars too, if not thousands. My feeling (and others I’ve spoken to about this) is that the credit card attached to your account will likely be stolen. They’ll run up a hefty bill on your account, leaving you holding the bag and liable for the amount payable to Facebook. The police could then become involved, asking for your version of why stolen credit cards were used on YOUR account. As the scammers only have ‘Advertiser’ level access to your account, you remain the Admin. Only ‘Admin’ level access can add a payment method. This means you’ll be requested to enter their credit card details. If it’s reported stolen, it will be difficult to explain to the authorities that someone else set this up. A search online shows that others who have fallen for this scam HAVE actually been paid a couple of hundred dollars. However, this ends within a few weeks, when they have their Ad Accounts shut down by Facebook…or for no apparent reason. I suspect this could be when the credit card is reported as stolen, at which time the scammers vanish from the Ad Account. As mentioned above, this is true. People who look at your page won’t actually see the posts. And yes, it is likely you will attract more followers; some people who see the ad will click through to your Page, and some of these will like it. Keep in mind though, they are not likely to be as engaged as those who have followed your Page after dealing with your business or engaging with your content both on and off Facebook. Be aware too that although these ads won’t be seen ON your page, there is no guarantee they won’t be seen by your actual Page followers. 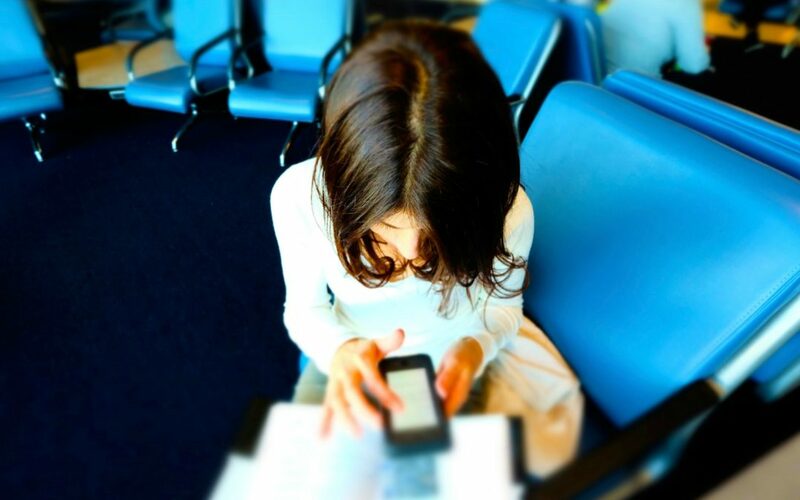 If they see an ad by you for questionable products or services, this could harm your brand. 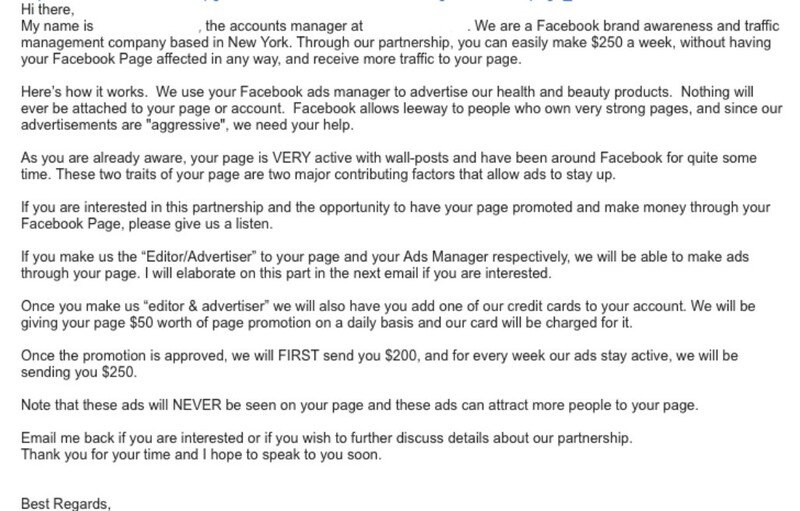 Do not engage with these types of companies or requests to run other people’s ads through your Facebook Ads account. Legitimate Facebook Ad Specialists WILL request access to your Facebook Business Manager account, often even before you’ve signed an agreement. This is so they can analyse your account and determine if there are opportunities for your business to achieve the results you seek. However, this is initially ‘Analyst’ access, to see your Ad Account reports. You can read more about Facebook Ad Account roles here. Put simply: don’t be caught out by this scam purely for the promise of a couple of hundred of dollars a week and more Page likes. The legal and financial risks to you, as well as to your Page’s reputation, are simply not worth it. What does this mean for businesses that want help to advertise on Facebook? Facebook ads can be notoriously hard to navigate and run successfully if you try to figure out how to run them by yourself. As a Facebook Certified Planning Professional, it concerns me that these scammers most likely run these ‘aggressive’ ad campaigns to achieve sales for legitimate businesses – that are completely unaware of the shady practices being used. This kind of scam also adds to the confusion in the industry about who to trust, and potential Facebook advertisers may miss out on the benefit of expert assistance if they decide to go it alone. Professional Facebook marketers will always work with you to develop a strategy for your ad campaigns – because this is YOUR business! Avoid any advertising through your Page or Ad Account that doesn’t give you the final say. 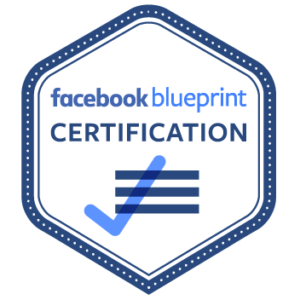 More and more Facebook professionals are becoming certified by Facebook’s Blueprint program, and I encourage all specialists to go through the certification process. It is one of the best ways to prove legitimacy and capability to manage ad campaigns. For businesses, Facebook provides online verification of certification for each individual. In a nutshell: Be careful who you partner with when it comes to your Facebook account, and remember, if an offer seems too good to be true, it probably is! How Much Should I Spend on Online Ads?